EVTC (TMOV) | World Products Inc. 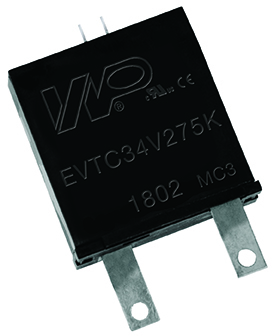 Wide voltage range available: 150VAC – 680VAC. Industry standard footprint and wave solderable. UL1449 and CUL 4th Edition recognized. File #E321567. (Meets SCCR 200KA rating). 50KA, 8/20µs peak surge current rating. Exceeds industry standard operating and storage temperatures for this type of device. Rated at -40ºC to +85º (operating) and -40ºC to +125ºC (storage). Equipped with normally open micro-switch providing diagnostics (if other micro-switch options are required, please contact WPI). Patents: USA, Germany, China,and Taiwan. EVTC's are intended, in conjunction with appropriate enclosure design, to help facilitate TVSS module compliance to UL1449. Under extreme abnormal over-voltage conditions, some units will exhibit substantial heating, arcing and venting prior to opening. Modules should be designed to contain this possibility.